But do people want them? Twitter is struggling to attract new users, so it's looking to other social networking apps for ideas. 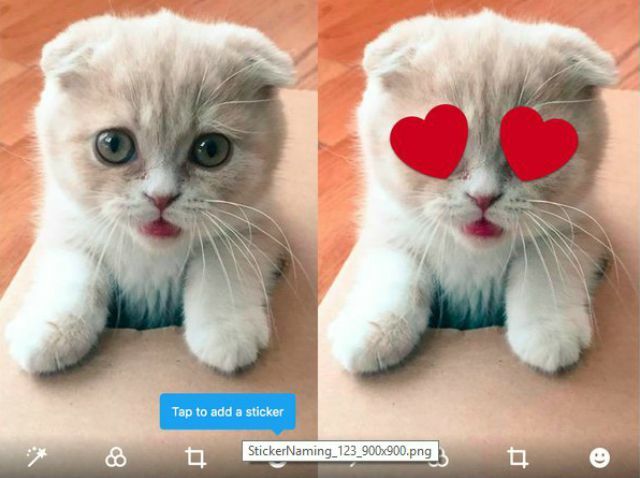 As Recode reports, the company is testing a new sticker feature similar to Facebook, allowing users to spruce up their photos with colorful, customizable additions. One such tester, @XBLFoxes, shared a screenshot with the new sticker option in the right-hand corner of Twitter's photo editor. The idea being, of course, that it could encourage people to tweet more photos and, in response, receive more likes, retweets and replies from other users. All of which would help Twitter to grow. A curious aspect, according to Recode, is the option to "see how other users from around the world have edited the same photo." Furthermore, Twitter will supposedly "suggest photos that you can edit and post to participate in trending conversations and breaking news." That sort of description suggests the feature is built for doctoring other people's photos, rather than your own. Such an approach makes sense for so-called "viral" news -- those moments when Twitter explodes with reactionary comedy. Stickers are still in a testing phase, so there's no guarantee that they'll ever roll-out to everyone. Nevertheless, it's an interesting peek at what Twitter's developers are working on, and an indication of how the company hopes to fight the rise of social apps like Snapchat.